Rugged: Aircraft-riveted construction throughout - means additional strength. Material: Special design, natural finish, highstrength, extruded aluminum (6063-T6 alloy). Pass-Thru Design: Can be loaded on one side and unloaded from the other for maximum efficiency and convenience. 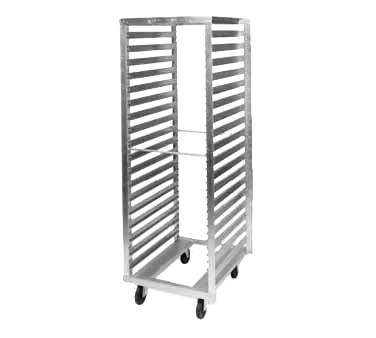 Sized To Fit Refrigerator: Rack rolls directly into refrigerator for quick and easy storage. You save valuable handling time and expensive labor costs. Construction: Pass-thru design, aircraft-riveted construction throughout. Materials: Special design, natural finish, high-strength, extruded aluminum (6063-T6 alloy). Casters: Two A5L on back - 5" ball bearing swivel, self-lubricating axle, rubber-wheeled, zinc-plated, bolted to full-length 14-gauge channel to bottom frame.